At Bixby Knolls Towers we believe events and activities enrich our resident’s lives. We create a fun, uplifting environment where our residents can be social, get involved, and enjoy their favorite hobbies and activities while enjoying their independence. 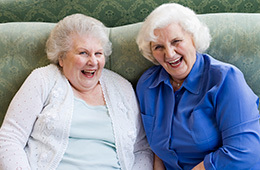 We understand that activities of daily living may become difficult for some. In assisted living, we offer the assistance needed to provide our residents the opportunity to be able to enjoy the retirement lifestyle they have been looking forward to while enjoying our featured amenities. At Bixby Knolls Healthcare Center, our nursing services are multifaceted. Our licensed nurses take care of the residents medically, emotionally, and physically. Our nursing team, in collaboration with resident physicians, ensure that each resident is cared for with compassion and understanding. Our restorative nursing and rehabilitation team is made up of registered nurses, licensed practical and vocational nurses, physical and occupational therapists, speech-language pathologists, and audiologists. All of the members of our rehabilitation team work together to help each resident attain their optimal level of independence, safety, and highest functional ability.